Las agencias de propiedad industrial de los cuatro países que forman la Alianza del Pacífico (Chile, Colombia, México y Perú), emitieron una Declaración Conjunta en la que acordaron “incrementar los esfuerzos para permitir, en el futuro, la adopción de medidas que beneficien significativamente, y cada vez más, a los usuarios de nuestros respectivos sistemas de propiedad industrial”. - Concretar el Programa piloto de la plataforma tecnológica de difusión de información y transferencia de tecnología, así como realizar talleres y seminarios de intercambio de experiencias e información. El Grupo Técnico de Propiedad Intelectual de la Alianza del Pacífico tomó nota de la Declaración Conjunta y acordó atender los aspectos propuestos incorporando en los trabajos de este Grupo las primeras dos actividades y continuar con las gestiones para la implementación del Proyecto piloto sobre la plataforma tecnológica de difusión de información y transferencia de tecnología. El texto completo de la Declaración Conjunta puede consultarse aquí. Más información sobre la Alianza del Pacífico aquí. At midnight tonight I am taking retirement, and will therefore be stepping down from a large number of intellectual property commitments – including blogging with IP Tango, which I founded some seven years ago. I therefore take this opportunity to wish my blogging colleagues the very best of good fortune in the future, and thank them for the privilege of working together with them on this lovely and valuable project. Since June 2008 IP Tango has received over 800,000 pageviews and has brought news, views and a fresh perspective to Latin American intellectual property law and practice. If you’d like to play a greater part in the life of IP Tango, whether as a possible blogger or just as someone who’d like to share information with our readers, do get in touch with Patricia Covarrubia at p.covarrubia@btinternet.com and let her know. Hace más de un año hablamos en IPtango de los problemas que el Gobierno Mexicano había tenido respecto al uso de la marca “REPUVE” como signo para designar al Registro Público Vehicular (REPUVE). Pues bien, gracias a nuestros colegas de ALHEN nos hemos enterado que el problema ha resurgido toda vez que el IMPI ha decidido iniciar una Declaración Oficiosa de Nulidad de la Marca “REPUVE” que legalmente ostenta la empresa SOCOM, S.A. de C.V.
En lo que se ha considerado como un hecho sin precedentes, no sólo porque la decisión del IMPI contraviene la forma histórica en que siempre ha actuado, sino también porque la Declaración Oficiosa se ha interpuesto aún y cuando existe pendiente de decisión un recurso ante el Sexto Tribunal Colegiado del Primer Circuito en un asunto anterior relacionado con la misma marca REPUVE. Ojalá el IMPI se pusiera en contacto con nosotros y nos proporcionará más información sobre su peculiar actuación. Más información sobre este asunto, incluyendo los datos de las partes/instituciones involucradas y de los procedimientos pendientes, puede consultarse aquí. Seguiremos de cerca el desarrollo de este asunto pues sin lugar a dudas seguirá dando mucho de qué hablar. (TCT) before the 2nd Civil Court of Rio de Janeiro (RJ) seeking a preliminary injunction prohibiting the infringement of its patent PI9811615-0 declared essential to the standard 3GPP and implemented in the ‘Alcatel One Touch 900M’ mobile device. "(a) terminate[s] the marketing of Alcatel One Touch 900M’device , including its manufacture, use, offer for sale (including any advertising), sale and import of mobile device without permission from Ericsson and so for take all appropriate measures for the immediate payment of products held by third parties, subject to a daily fine of R $ 100,000.00; (b) refrain[s] from any act that may contribute to the activities listed above, including any transfer regarding the ‘Alcatel One Touch 900M’ device, as well as any other act inconsistent with what is determined by the court when the eventual approval of the grant of the preliminary injunction, subject to a daily fine of R $ 100,000.00". However, unlike in the judgement given by the Court of Justice of the European Union in the dispute Huawei v ZTE (Case C-170/13), the RJ Court granted the preliminary injunction to protect the interests of Ericsson. Actually, the Brazilian court did not raise questions that would evaluate the balance of interests between SEP holders (hold-up) and the potential licensees (hold-out) concerning negotiations aiming at determining fair reasonable and non discriminatory (FRAND) rates. "This patent belongs to [Ericsson], which did not allow its [use] by the defendant, who, it seems, is violating the intellectual property rights of the patentee. The violation of the patent holder’s rights is irreparable or of difficult recovery, growing every day, in apparent damage to its assets, since the liquidation procedure of this kind of damage hardly fully applies to all committed unlawful acts, not to mention the difficulties for the compliance with judgment in certain cases. Thus, the principle of effective judicial decision recommends the anticipation of the effects of the protection. So, I grant the request for injunctive relief for the purpose of determining the defendant, subject to a daily fine of R$ 100,000 reais: (a) to refrain from marketing the Alcatel One Touch 900M device, including its manufacturing, using, offering for sale (including any advertising) and import, without permission from Ericsson, and from doing any act that might contribute to the activities listed above, including any relating to the transfer device; (b) to take all appropriate measures for the immediate withdrawal of the devices maintained by third parties such as resellers. (See document TJERJ. Decisao. 2012)"
Ericsson brought three other legal actions, which are all appended to the first case. 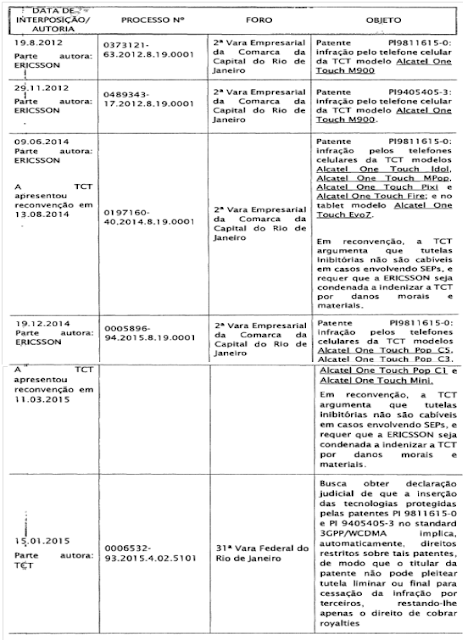 The actions relate to alleged violations of patents P198116150 and P194054053 concerning the selling of the following devices in Brazil: Alcatel 900M, Alcatel One Touch Idol, Alcatel One Touch MPOP, Alcatel One Touch Pixi, Alcatel One Touch Fire and the Tablet Model Alcatel Touch Ev07, Alcatel One Touch Pop C5 , Alcatel One Touch Pop C3 , Alcatel One Touch Pop C1 and Alcatel One Touch Mini . 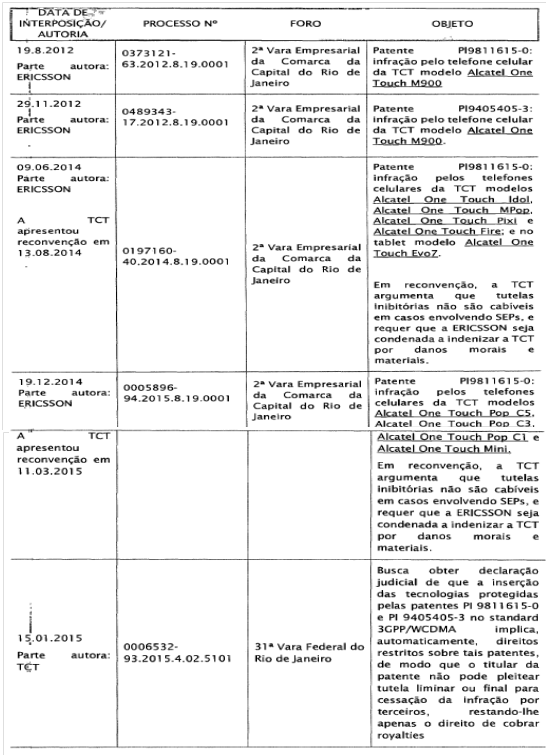 Here is a table indicating all the legal cases between Ericsson and TCT in Brazil. However, CADE denied TCT’s demand of TCT’s request. Notably, it held in paragraph 6 of the decision that Ericsson’s actions were not sham litigation but actions to avoid hold-out. As to the categorization of anti-competitive behavior, it noted that Ericsson indicated that its present-day activities are restricted to research and technological development in the telecommunications sector, neither therefore influencing the marketing of cell phones or tablets, nor distressing the market of TCT products, nor improving Ericsson’s competitive advantages, in the absence of a patent licensing agreement. It is worth to mention that Ericsson submitted to CADE elements showing hold-out: its arbitration demand brought against the TCT, the lengthy period of FRAND negotiations, as well as the achievement of FRAND licensing deals with several other buyers. At present, all legal cases are stayed according to U.S. District Judge James Selna’s decision who granted to TCT an anti-suit injunction against litigation in France, the United Kingdom, Brazil and Russia. Guest post by Magda Voltolini. Trans-Pacific Partnership - Intellectual Property: How might it affect European SMEs doing business abroad? The Trans-Pacific Partnership has recently been ratified. It is an international treaty that sets a series of terms aimed at improving the commercial relationships among the Signatory Parties. The members who ratified the TPP last October were: United States, Japan, Australia, New Zealand, Chile, Mexico, Peru, Singapore, Brunei, Canada, Vietnam and Malaysia. Other countries such as China or Colombia chose not to enter the agreement at this time, however it does not preclude them from joining it in the near future. May a European SME benefit from the Treaty? Yes. Even though there are some rules that will only benefit companies based in the Member States of the Treaty, there are others directed towards the improvement and harmonization of legal systems and institutions of each Member. Concerning Intellectual Property Rights, the “National Treatment” and “Most Favoured Nation” principles from the Paris Convention makes it mandatory to apply the same advantages that the State concedes to its own nationals (or nationals from third countries) to the nationals from Signatory Parties (all EU countries belong to the Paris Convention). Trademarks: What will be the main advantages for EU applicants? One of the first obligations that the TTP imposes on signatory parties is to ratify two Trademark-Related treaties: The Madrid Protocol and the Singapore Treaty. The first one establishes the implementation of the Madrid System under WIPO´s administration, which allows for the application of an International Trademark Registration in each member of the Madrid Agreement/ Madrid Protocol. EU citizens and companies will therefore be able to request the protection of their International Registrations in countries such as Peru, Chile, Brunei or Malaysia, which is usually cheaper and simpler than applying for a National Trademark on each of these countries. On the other hand, the Singapore Treaty aims to harmonise the application, registration and management procedures of Trademark files. Thus, applicants and holders in countries such as Brunei, Chile, Peru, Vietnam and Malaysia will benefit from the advantages of the harmonization of Trademark procedures, which will be closely similar to those in their countries of origin. Other important changes to highlight are the suppression of the visibility of the sign requirement that is targeted to allow the registration of non-conventional Trademarks (such as smell trademarks and sound trademarks) or the obligation of maintaining an on-line and freely accessible Trademark database. Other consequences of the TPP is that the three Latin American members of the TPP, Mexico, Chile and Peru, plus Colombia have signed a Joint Declaration aimed at harmonizing their procedures on Trademarks and Patents and to develop good practices to reduce the granting time. Patents: How EU SMEs can benefit from the TTP provisions? Under the TTP the Parties are obliged to sign the Budapest Treaty on the International Recognition of the Deposit of Microorganisms for the Purposes of Patent Procedure. Hence Patents that include microorganisms as part of it will be accepted in each Member of the Treaty. Another novelty is the setting of a grace period, whose scope will be extended to 12 months prior the Patent Application. Any disclosure done by the applicant or a third party that obtained the information from the applicant will not be taken into account when evaluating the novelty of the patent (WATCH-OUT! European countries do not provide for a “grace period” therefore any disclosure may jeopardise your European applications’ novelty). One of the most common problems that EU companies face when patenting abroad is that grant procedures tend to be longer than in Europe. The TTP provides for the possibility of requesting a “Patent Term Adjustment” when unreasonable delays have been incurred during the issuance of the Patent. We should wait to see how TTP Members include such obligation within their laws, but it will certainly have a deterrent effect on Patent granting delays. Copyright and Related Rights: What is new? The main milestone on Copyright and Related Rights protection is that Signatory Parties must ratify the WIPO Copyright Treaty WCT and the WIPO Performances and Phonograms Treaty WPPT. WCT slightly expands the scope of Protection stated in the Berne Convention concerning economic rights and also includes specific articles on software and databases’ Copyright protection, whereas WPPT harmonizes the protection of certain related rights, namely those of performers and producers of phonograms. Additionally, TPP expands the duration of economic rights to seventy years after the author’s demise. Enforcement: How will TPP help EU SMEs to enforce their rights? The scope of the TPP also comprises measures addressed to ensure the effectiveness of the IP enforcement. For example, there are articles that strengthen the role of Technical Protection Measures (TPMs) in digital contents by establishing that the circumvention of such measures will be considered an infringement regardless of the infringement of the Copyright of the content itself. Another measure towards an effective enforcement is the possibility that the Signatory Parties set pre-established and/or additional damages in case of infringement. Both cases aim to have a deterrent effect. Additionally, pre-established damages will also be very helpful for the purposes of awarding damages to the right holder. Finally, a series of dispositions are aimed at obtaining the cooperation of Internet Services Providers in order to stop infringements and identify infringers. Such dispositions have been very controversial. On November the 10th, the Chilean House of Representatives approved bill 10272 which endorses the Treaty of Marrakesh. The Treaty has been signed by eighty States (in Latin America by Argentina, Brazil, Colombia, Peru and Mexico). The Treaty of Marrakesh is the first international intellectual property instrument that addresses the problem of cross-border exchange of works that have copyright protection, incorporating explicit rules concerning the import and export of accessible copies. 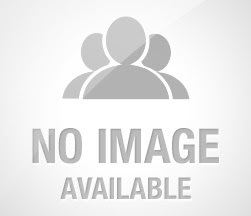 Thus, once a work is converted to an accessible format in a country, to the recipient on this people, that copy may be exported to other countries. These measures seek to reduce the costs associated with the production and distribution of copies in accessible formats, eliminating or at least reducing transaction costs associated with the protection of copyright works and expanding the potential target, which is expected impact on lower total costs, favouring especially to beneficiaries residing in developing countries. In Chile the catalogue of works available for people who are in this situation counts to only 5% of published works in the world. 'Frutas do Brasil': 'Gifted by the Sun' logo launched. Apples, oranges, limes, lemons, avocados, bananas, melons, watermelons, grapes, tangerines, papayas and mangoes grown in Brazil are exported to over 70 countries. A large share of those exports reach origin-aware European consumers, as well as markets such as the US and the Middle East. with the sun on the background. Building up on consumers’ perception, the main association of Brazilian fruit growers and exporters, Abrafrutas, in conjunction with the Brazilian Trade and Investment Promotion Agency (ApexBrasil) designed a logo that identifies the provenance of their core goods. 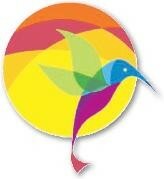 It consists of a colourful, stylized hummingbird with the sun in the background, and the indication “Frutas do Brasil - Gifted by the Sun”: a clear reference to the climatic conditions and the happiness associated with Brazilian lifestyle. The occasion for the launch of the new logo has been, appropriately, an industry event held in Madrid last week. Despite its potential, most of the Brazilian fruit production is currently absorbed by the domestic market: the logo is part of a strategy aimed at better promoting Brazilian core fruit products abroad. A key element of this strategy is the synergy amongst producers, an aspect which contributed to the success of a similar initiative launched in 2012 by the Chilean Fruit Exporters Association with the logo 'Fruits from Chile'. In Lima, Peru, took effect the fifth edition of ‘LIF Week’. This event invites fashion designers to show their work. The event revealed the ‘Autumn-Winter 16’ proposals and trends by national fashion designers. Helping the fashion industry, the Peruvian Instituto Nacional de Defensa de la Competencia y de la Protection de la Propiedad Industrial (INDECOPI) prepared and made available to the public a guide: ‘Copyright in the Fashion Industry’. This guidelines are said to promote knowledge and ‘foster respect for the rights of the creators of fashion.’ The guideline is accessible here. • fashion creations are considered works of ‘applied art’. They need to be original according to the law i.e. the creation expresses the personality of the designer (Art 2, s 20 of the Act). It states that a work of applied art is an artistic creation with utilitarian functions or incorporated in a useful article, and it could made by hand or produced industrially. Elaborating on this, the guide notes that ‘not all fashion creations shall be protected by Copyright as works of applied art, but only those which are or embody original artistic creation’. It also estates that fashion designs ‘usually has a utilitarian function (such as dressing the body of a person).’ It gives examples of garments in general but notes also accessories such as gloves, scarves, hats, jewellery, among others. • fashion is also likely to be protected by other intellectual property rights such as trade marks. A registered trade mark protects the distinctive sign that the fashion design may have e.g. logo. However, in this case, what is protected is the logo, not the garment/design as such. The guide given example is the monogram YSL displayed in clothing and accessories – protected by trade mark as a registered trade mark for Yves Saint Laurent (Indecopi, N° 114706 in Class 25). It also may be protected by industrial design and gives the example of the design of a particular pattern fabric featuring a monogram. This type of work is created by 2D and 3D forms that are incorporated into the garment and produced in scale such as GUCCI. Again what is protected is not the fashion design but the pattern featuring the monogram ( Design D359,166 USPTO). INDECOPI’s Directorate of Copyright reminds interested party who wish to protect their work, to visit their website at http://www.indecopi.gob.pe/ddavirtual/informacion, where they can find information about the registration of their work. 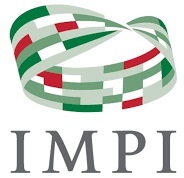 INDECOPI notes that the institute ‘reflects its continuing interest in promoting, among the creative industries, the tools of protection of intellectual property as an engine for economic development. At the same time, it reaffirms its commitment to strengthen the culture of respect for copyright, source of job creators and means of expression of our cultural identity’. Indeed according to Christiane Schuman Campbell, 'the fashion industry in the United States generates more than $300 billion in revenue each year' and thus gives a substantial contribution to the U.S. economy. 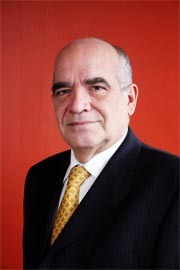 The iptango feels proud to announce and to invite the Latin American region to the act of conferring the 'Honorary Doctorate' (post-mortem) from the University de Los Andes, Merida Venezuela to Dr Ricardo Antequera Parilli. The act will take place in the Aula Magna de la Universidad de los Andes, Tuesday 10 November, 2015 at 11.00 am. The invitation also extends to the unveiling of the plaque by which the library of the Specialization in Intellectual Property from the University de Los Andes is to be called Dr. Ricardo Antequera Parilli, Tuesday 10 November 2015 at 8.00 am. Dr. Antequera Parilli was widely considered in the legal community to be one of the leading forces in intellectual property in South America. His career and dedication to IP spanned over four decades and encompassed achievements that included drafting some of the copyright (authors' rights) laws for several countries in Latin America, including Venezuela, Costa Rica, Panama and the Dominican Republic. He was also the co-drafter of the Intellectual Property Chapter of the Treaty of the Group of Three and Decision 351 on the Common Provisions on Copyright and Neighboring Rights of the Andean Community. His expertise extended to all aspects of intellectual property law but he was without equal in copyright law. Along with his deep impact on IP law, Dr. Antequera Parilli greatly influenced many students through his teachings at universities throughout South America and Spain. To his students, he was a brilliant scholar, a caring professor and a devoted teacher. Often described as a "walking encyclopedia of IP", he co-authored 17 books on intellectual property and published more than 150 articles. His deep knowledge of IP together with his exceptional willingness to mentor others are qualities that colleagues, as well as his students, will remember. El Postgrado en Propiedad Intelectual de la Universidad de Los Andes - Venezuela nos ha informado de 2 actos que se celebrarán la próxima semana, el 10 de noviembre de 2015, en honor y reconocimiento al Dr. Ricardo Antequera Parilli, profesor de dicha Especialización e insigne figura en el área de la Propiedad Intelectual. El primero de ellos es el acto de develación de la Placa en la que se confiere el nombre de “Dr. Ricardo Antequera Parilli” a la biblioteca EPI del Postrado en Propiedad Intelectual de la Facultad de Ciencias Jurídicas y Políticas de la Universidad de Los Andes. El acto se celebrará a las 08:00 horas en la sede del citado Postgrado. Posteriormente, a las a las 11:00 horas, se celebrará el acto de Conferimiento de Doctorado Honoris Causa (Post-Mortem) al Dr. Ricardo Antequera Parilli, acto se tendrá lugar en el Aula Magna de la Universidad de Los Andes. Sin lugar a dudas son dos merecidísimos reconocimientos. Para más información y/o confirmar asistencia enviar un correo electrónico a epi@intercable.net.ve.